A visual tour of New York and New Jersey parks and trails through the eyes of its photographers, brought to you by the New York-New Jersey Trail Conference. As fall continues to push forward through our area hopefully everyone is out and enjoying the colors, hiking and of course taking pictures. As photographers we always look for some scene that inspires us. Maybe it’s a mountain, a sunset or a lone colorful tree. Usually landscape photographers want their images to be devoid of all things human such as buildings and people themselves. I personally may not always want a building in my landscapes but if I’m shooting and a person wanders in my image and it adds to the overall composition and feeling than I’m capturing it. I’m speaking specifically about a person that is unrecognizable but adds significance to the photo. If you shoot a person and you can clearly recognize them and that image is published you will need a model release. That’s another discussion for another blog. Having a person in the image provides scale. It also shows us in context to the greater environment. A deeper connection to the mountains , forest and water that surrounds us. 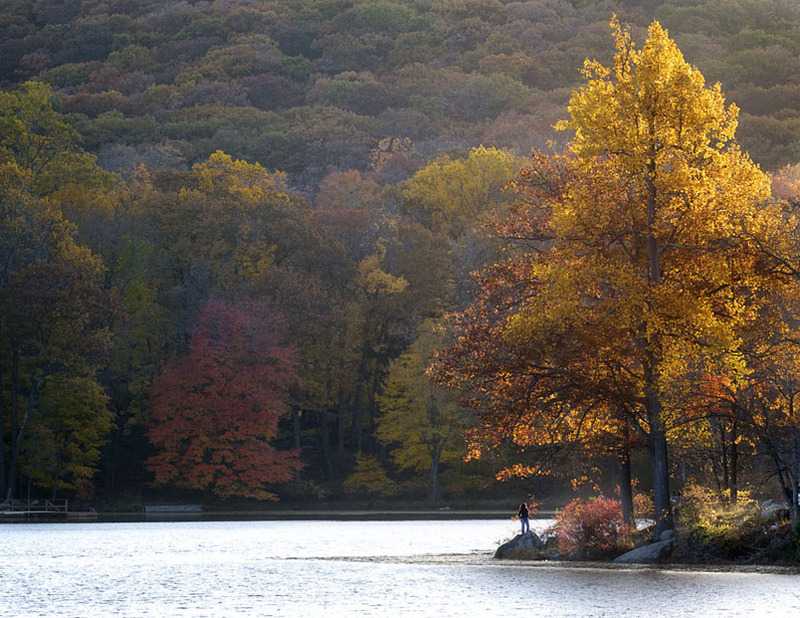 This image was taken in Harriman State Park. The first thing that caught my eye was the light hitting the tall golden tree and how it stood out against the shadowed mountain. I also loved the person standing on the rock taking in the beauty. She adds scale to image and in a deeper sense our place in the environment as a whole. I don’t go out of my way to find people but sometimes it just happens and it really adds the final capture. This entry was posted in Techniques by Larry Zink. Bookmark the permalink.